We love to camp. We're not the "backpack into the wilderness and bring pouches of dried goods" kind of campers. We're not the sit back in the RV and watch movies kind of campers either. We're in the middle. We bring a tent. We sleep on an air mattress. Squeezing everything into the Civic. Mac had a little nook! Watching Josh play with the fire. It never fails to entertain! Junk food and no kitchen to clean! Watching Mac enjoy his first camping trip. He loved it! Trying to get a picture of Mr. Mac jumping like a bean! 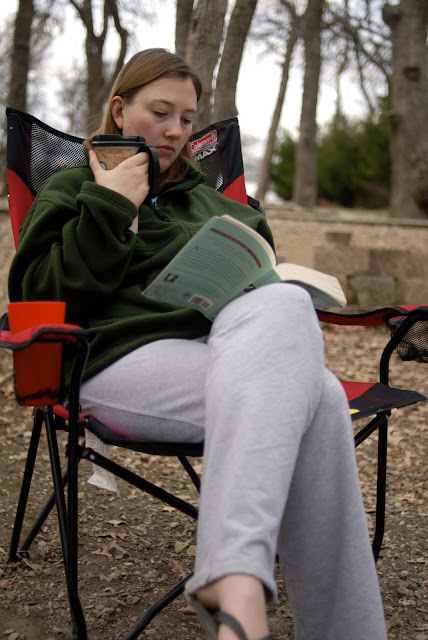 Coffee+Book+Fire+Cozy Clothes = pure enjoyment! Any one else do something fun for spring break? I love to camp too. The same way as you tents and air mattresses. A little too cold here yet but I can't wait!! Looks like you had a nice relaxing time and the breakfast in the foil...a perfect idea! I'm so enjoying perusing your blog. You, your dog, & your blog are so cute. The camping trip looks so fun. Thanks for stopping by to see me & for leaving a comment.